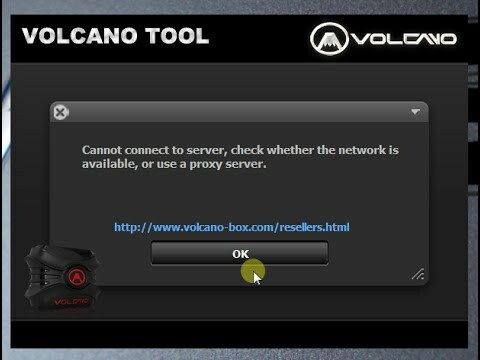 If you are using Volcano Box, then you must know about the error message "Cannot Connect to server, check whether the network is available, or use a proxy server", while you install Volcano box on a new PC or when you format your Computer system and install volcano box/volcano utility. So here is the new and 100% working solution for those who face like this problem on Volcano Box. To day I faced this problem on the Volcano Tool, when install volcano tool on a new PC, I got this "Cannot Connect to server, check whether the network is available, or use a proxy server" error message, and follow some techniques or ways following the Internet but not success. 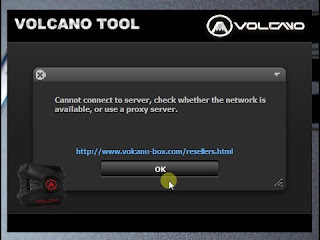 Then I try to find out a new solution for this and success, the below is the best and working solution for "Cannot Connect to server, check whether the network is available, or use a proxy server", if you are facing same problem with your Volcano Box then try the following trick or process to solve Volcano Box Error message. 1) First Install the latest version of Volcano Utility and Volcano Yellowstone. 2) Latest version of volcano box is VolcanoUtility_v2.8.3_Volcano Yellowstone and VolcanoUtility_v3.0.9_Volcano Module. 3) Now connect the volcano box and install driver and open the Volcano Utility. If the above solution is not working, then use the following solution which is 100 percent working. 1) Download and extract Merapi Tool_1.4.7_20160313.rar or you can download the latest version Merapi Tool. 3) Now click on Cancel to close the Merapi Tool. 4) Then open Volcano Tool/Volcano Utility it will not show the error message again. That's all now you can use the Volcano Tool and you will not get any error message like "Cannot connect to the server". Volcano new update has been released , download Volcano new update 2017 here and try to activate the Volcano Box. Volcano Box 3.1.0 latest update here. Volcano Box 3.1.0 latest update Download here. Download and install the latest version of Volcano Box and the problem of server will be solved. You can download the Volcano Box latest setup file here. Download the .zip file from the above link and extract it into the VolcanoUtility_v2.8.3_Volcano Yellowstone Folder and now connect the box to the PC and open the Volcano Tool or Volcano Utility and your problem is solved now. The PC must be connected to Internet. Please check all replies in comments, and you will get the idea to solve the activation server problem in Volcano Tool. but is there any improve in terms of function and model supported?. Please update Volcano tool or utility to latest version and try it will must solve the problem. You can download Volcano tool latest version here just check the link given in comments.